You know the phrase—shoes make the man. Okay, that’s not exactly the saying, but you get the idea. Bottomline—(clever, right?) shoes aren’t just shoes. They’re part of who we are, how we feel about ourselves and how we want others to see us. And like everything in history, shoes have amazing connections worldwide. The historical adventures of Chukka boots, the studious stylings of loafers, the reverence of Monk Straps and the classic comfort of the Oxford all make for amazing stories. Alexander Noel's Chukka Boot -"The Sahara"
We could call this style an evergreen because it is always fresh. Shoe historians (yes, they do exist) say the Chukka dates back to a British and African collaboration during World World II. British Troops deployed during the North African campaign could not use their traditional military boots because of the discomfort and lack of adaptability. The military, working with local artisans in Cairo, created a comfortable boot to withstand the African desert heat and the required agility for combat. The unique advantage of a lightweight boot securing close to the ankle also reduced sand from getting into the boots. Today, the Chukka offers versatility with its smooth leather upper and rubber sole for more casual wear. Whether in leather or suede, the ankle high boot with a secure lacing, provides great versatility. Every sophisticated man should own a pair of Chukka Boots. We call ours “The Sahara” and you don’t have to go to the desert to get them. Alexander Noel's Loafer -"The Collegiate"
Think staple, not slouch when you think loafer, because it should be a major player in your wardrobe. From a traditional welt moccasin to penny loafers and tassel styles, loafers can be worn for just about every occasion. The sleeker new look loafers are even perfect for business attire. Shoe historians haven’t reached a consensus on who did what and when. But the general story is that when Norwegians came to America, saw the moccasins worn byAmerican Indians, they just had to have them. They brought the concept back to Norway, created a different sole, and the loafer, as we know it, was born! Over the years, American designers added their touch to these go-to shoes. Our “Graduate” style sports a tassel while “The Collegiate” penny loafer is an updated spin on this classic. Back to school or the Board room never looked so good. Alexander Noel's Oxford - "The United Kingdom"
Call yourself an Oxford man, man. Talk about a shoe with history, this is it. The first legend originates in Scotland in the mid-1600’s. It’s believed the Oxford (captoe) shoe was created near a castle. If you guessed Balmoral, you’re at the top of the leaderboard! 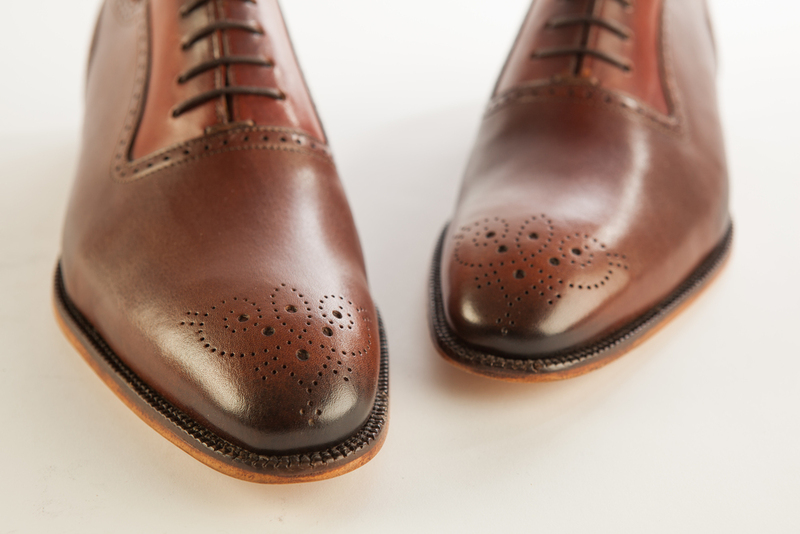 Legend number two dates back to 1825 when the Oxford actually started as a boot. The lace-up leather stalwart was cut down from its boot height which sparked the first collegiate hot trend among students at Oxford University. Thus the name, The Oxford shoe.No matter which version you prefer, the Oxford is a global star. This classy lace-up can sport medallion perforations, captoes and pic-stitching for added attention. And no matter what country you wear it in, artisans update this classic with new designs and colors for trendy appeal. Buckle up. It’s going to be an amazing ride. That is, if you’re wearing a Monk strap. No laces, no problem. The belt-like strap with anywhere between one to three buckles anchors this style. Word is, this shoe has a deep and abiding history. That’s because the original Monk strap was created by European monks. They wanted to protect their feet with a leather cover as they completed their daily activities. Historians estimate the European Monk shoe was created sometime between 1600 and 1800. Today’s Monk straps come in a wide variety of styles such as single, double and triple straps plus materials like suede and moccasin welt, along with split toe, cap toe and wing tips. The versatility of a monk strap with a suit, summer linen pant, jeans and chinos provides a great flair that makes this shoe stand out.